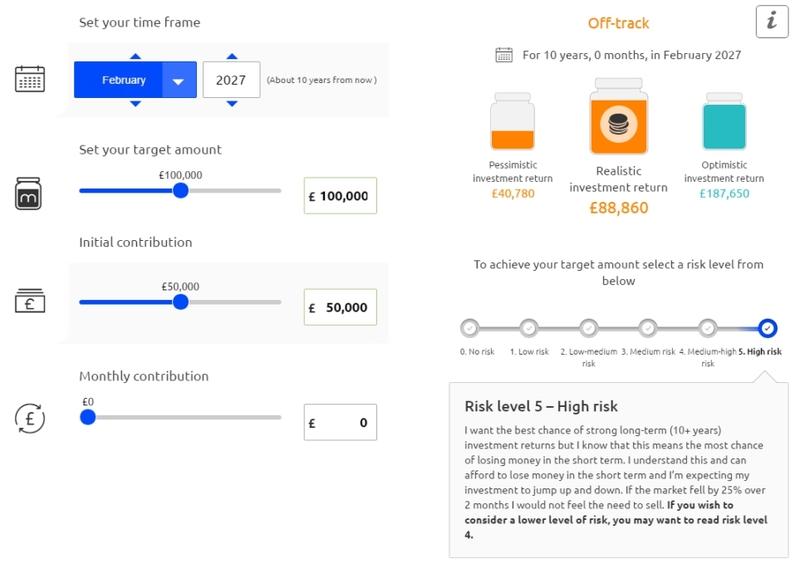 At first sight, the service differs from the other robo-advisors in being goal based. 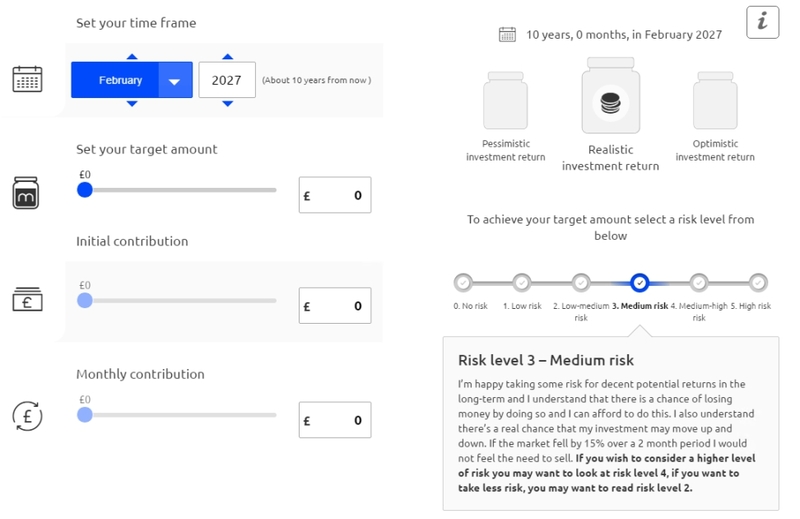 You choose a target amount, a time frame, your contribution levels and a risk level. This page lets you play around with the options before registering for an account (and the inevitable sales calls). So I chose rainy day instead. The chatbot pushed me towards an ISA, which suggests to me that Munnypot aren’t offering SIPPs. 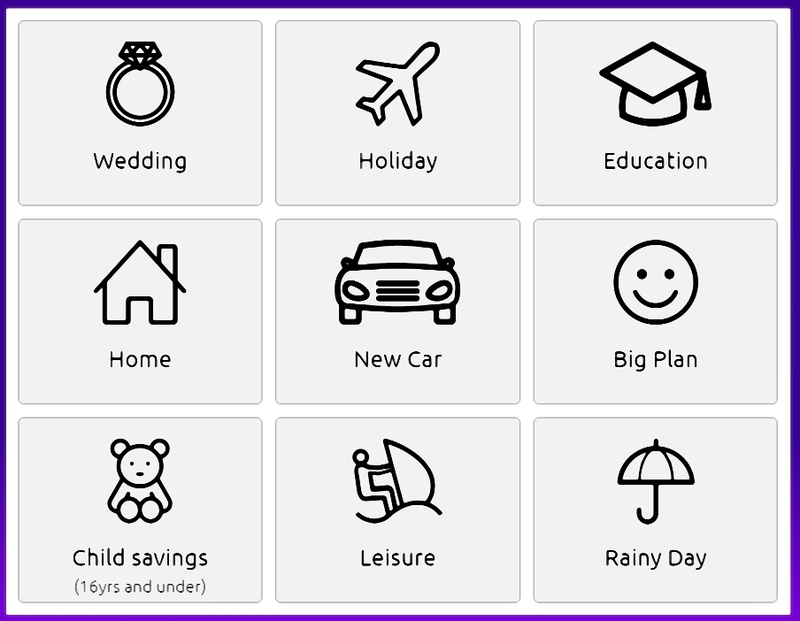 They fill your ISA each year automatically, and keep the rest of your money in a General Investment Account (GIA). The chatbot also offered me the option to transfer in any existing ISAs that I might have. It also asked me to consider life insurance and paying off my debts before saving. And to consider paying off part / all of my mortgage. The next step was to choose a risk level. The next step was the initial and monthly contributions. 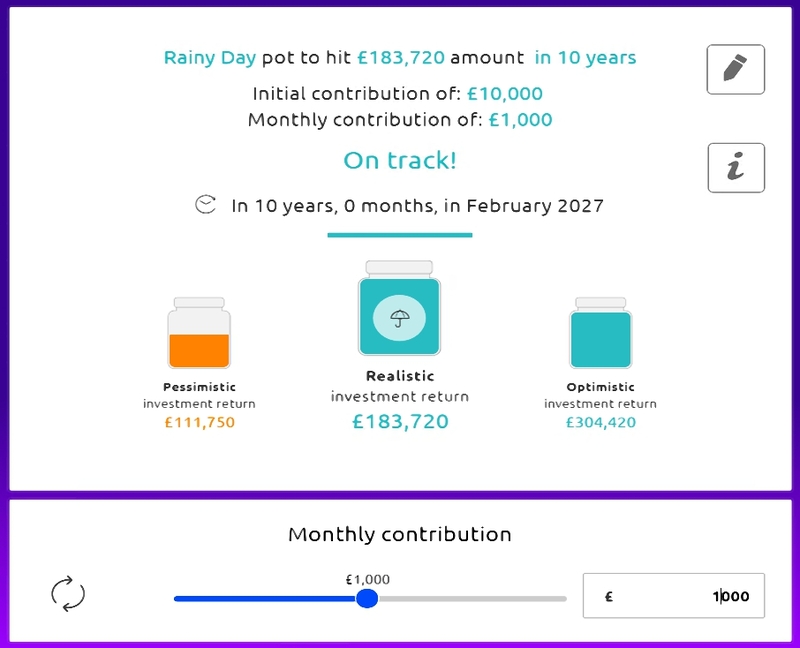 I chose £10K initial and £1K a month to keep the maths (relatively) simple. That put me on track for £183K in 10 years. At which point I would have contributed £130K. So growth is £53K over 10 years – again, not too aggressive. After that, the chatbot wanted a lot of personal details, so I called it a day at that point. and there is a one-off “advice fee” of up to £500 (on investments of £100K and above). The advice fee means that you’ll have to make a long-term commitment to the site. The Munnypot chatbot suggests a minimum of a five year investment. The ongoing fees are cheap, once you get past the first year. Even at the highest risk level I couldn’t double my money over 10 years, so the portfolios are obviously conservative. When the post was first published, I described the LifeStrategy funds as target date structures. I don’t recommend these since the 2015 pension freedoms. We now have to manage a portfolio through 30 years of retirement, so sticking with equities makes more sense. But in fact, Vanguard calls that range of funds TargetDate funds – LifeStrategy are the vanilla funds. The Moneypot interface is slick, and the fees appear to be low once you get past year 1. 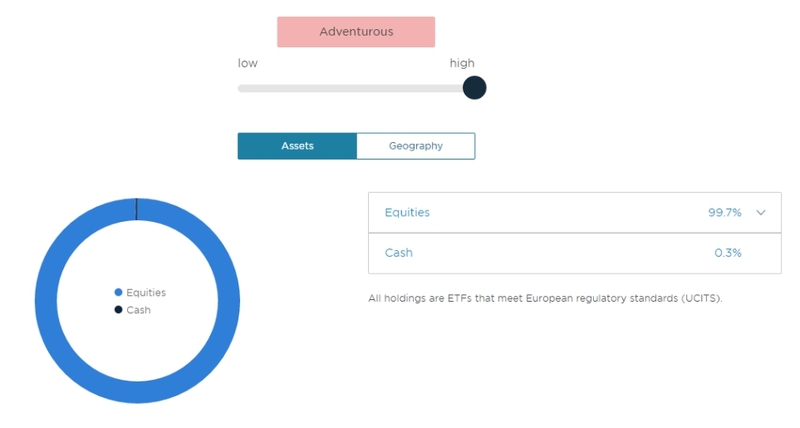 But in fact, the portfolios consist of a single fund that you could invest in more cheaply for yourself. Vanguard charge 0.22% a year for their LifeStrategy funds in the UK. So you are paying a one-off 0.5% advice fee and an annual 0.11% platform fee to buy a single fund. And it looks as though MunnyPot may be adding a 0.02% markup to the ongoing costs of the LifeStrategy fund. This is not robo-advice, it’s the old fashioned IFA service hidden behind a slick website mask. Nutmeg, whose service we covered back in June 2015, has changed its fees. The publicity surrounding the change suggested that it would be a cut in fees for most of its customers. Is that true, and more importantly, are Nutmeg now cheap enough? 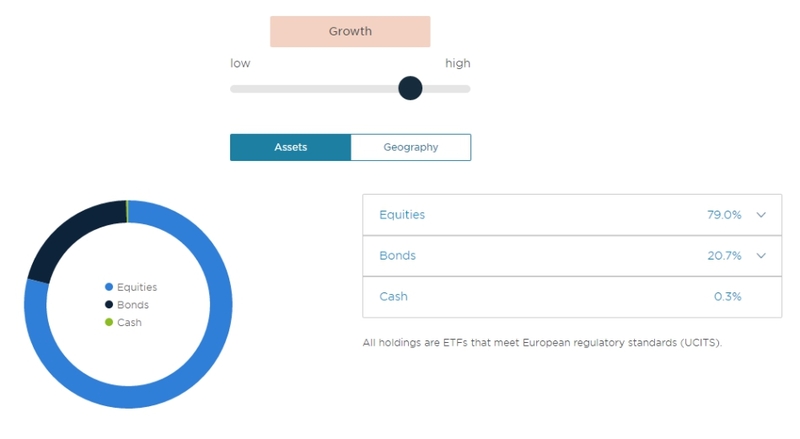 Nutmeg used to have a platform fee for its rebalanced portfolios, plus a charge for the underlying ETFs. So to get to an acceptable fee level, you need to trust Nutmeg with £500K. Apart from the high fees, we didn’t like the conservative asset mixes. Even at risk level 10, you were only given a few percentage points of emerging market equities, and 1% of alternative assets. Looking at the press release, it seems this isn’t their first change to the fee structure. To make things a bit clearer, I’ve put together a table. The second fee structure (from 2016) made things a bit cheaper at the bottom end and more expensive at the top end. 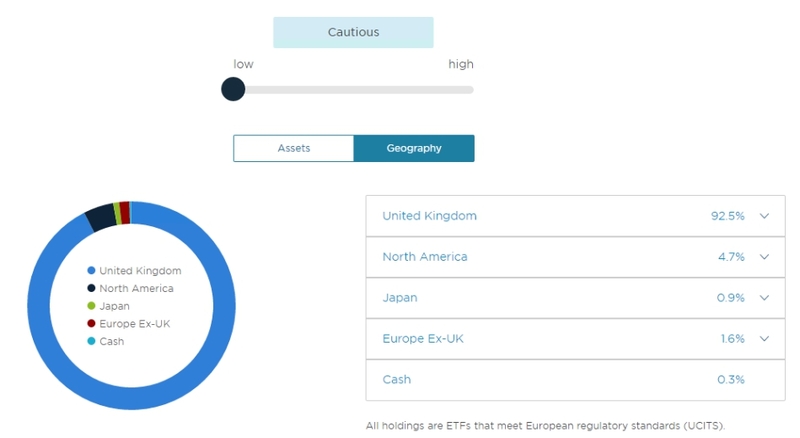 In addition, Nutmeg have revised their declaration about the underlying ETF fees from “0.19% pa” to “between 0.13% and 0.22% pa.
Nutmeg also says that you don’t have to go onto the new fee structure unless it benefits you. And I also have reservations about putting money with a platform that changes its fee structure every year. I would like someone to make a commitment to being the lowest-cost provider in the market (as Vanguard pretty much does with ETFs). 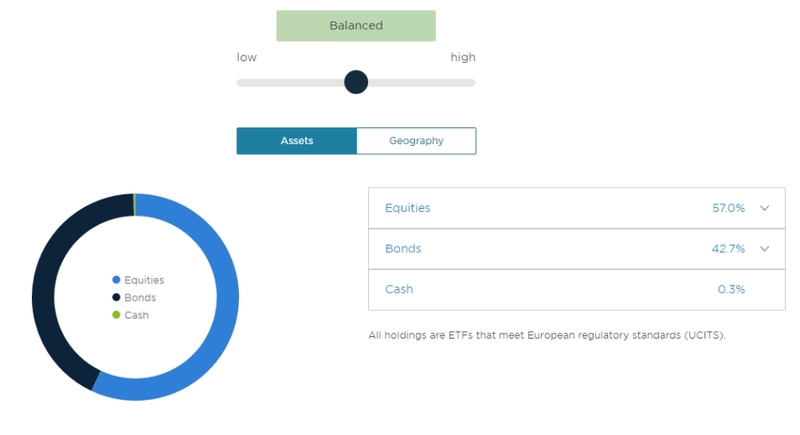 Nutmeg has also introduced five “fixed allocation portfolios”, where the asset allocation will never change. In contrast, the earlier portfolios were actively managed to some extent, within a chosen risk profile. 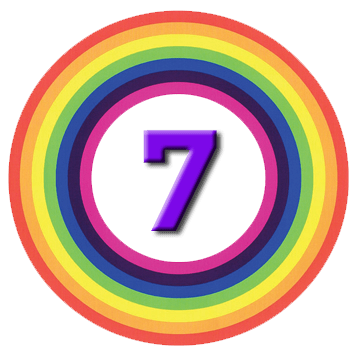 This is getting into the right ballpark, so let’s look at the portfolio allocations. To save time and space, I’ll just look at the low, medium and high-risk portfolios. The Cautious portfolio could be described as UK bonds. 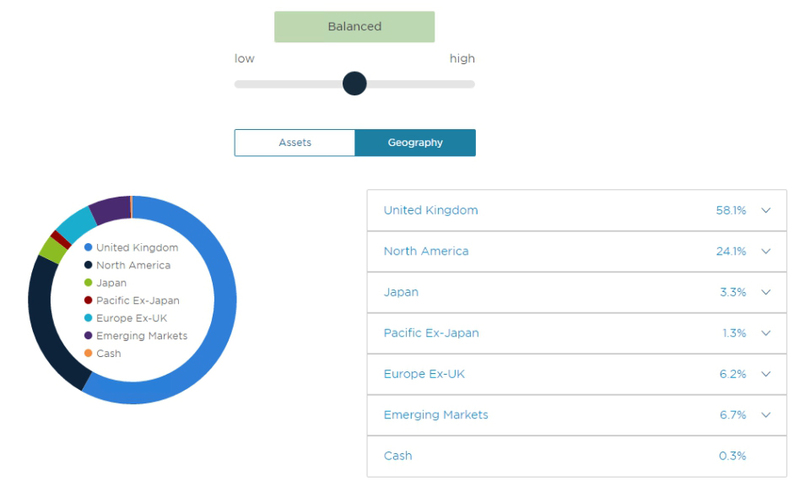 The Balanced portfolio is a traditional equity / bond split, with a fair amount of home (UK) bias, but not necessarily too much for everyone. 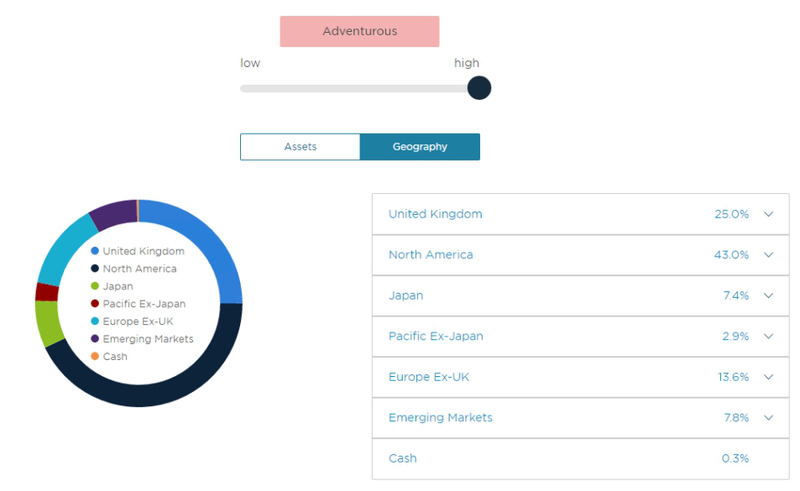 The Adventurous portfolio is 100% stocks, with something of a US bias. Since Balanced and Adventurous were either side of what I was looking for, I decided to look at risk level 4 as well. 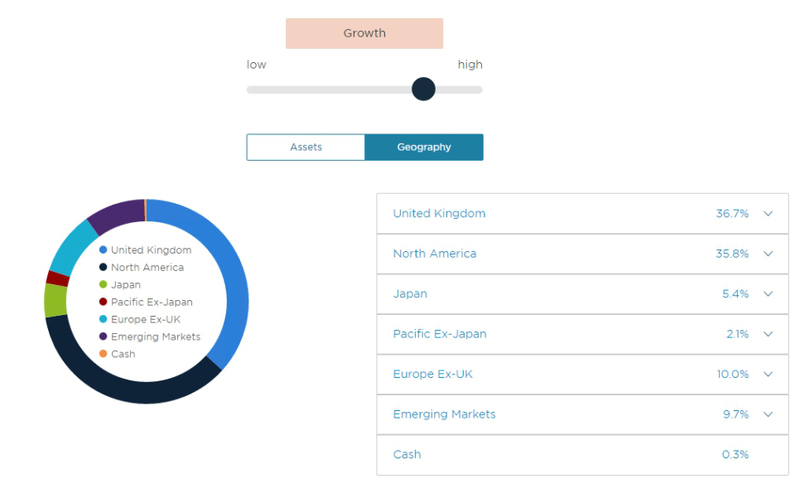 The Growth portfolio keeps 20% in bonds, and has less of a bias to the US. I think that the three riskiest fixed allocations from Nutmeg could be useful as core portfolio holdings. I don’t normally write about US robo-advisors, but today I’m going to make an exception. Betterment, the grand-daddy of robo advice, has announced a fee increase and a new platform offering human advice (as reported by Michael Kitces on Nerd’s Eye View, amongst others). Betterment has always charged a 0.25% robo-platform fee for accounts between $10K and $100K, but has now raised its fees from 0.15% to 0.25% (a 67% increase) for accounts larger than $100K. And it is also offering direct access to financial advisors for between 0.4% and 0.5% on top. The inference has to be that the original model has proved unsustainable, even at the scale reached by Betterment. As Michael points out, this turns Betterment into a traditional platform, charging 0.25% pa regardless of what you do with your money. It also represents a shift from Betterment competing on price, to competition based on the level of sophistication of robo-technology. We’ve looked at three quite different offers today. MunnyPot is a misleading service, if you ask me. The interface makes you think that the platform is learning about you so that it can offer a tailored solution. But in fact they are charging you up front and ongoing fees for a widely available one-fund portfolio. It could be argued that Munnypot have moved directly to the new Betterment position of competing on the basis of technology rather than price. Elsewhere, fees are still heading slowly downwards, but even with the Nutmeg Fixed Allocation portfolios, you would need to invest £250K to achieve a 0.52% fee. 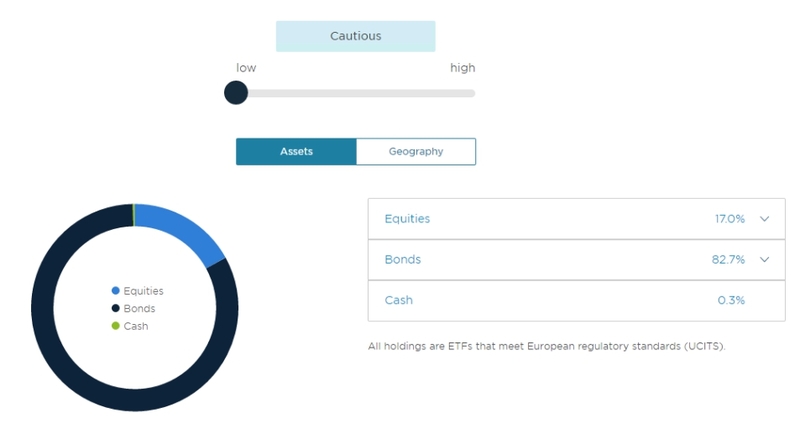 Within that product, the three riskiest allocations are well worth consideration as a core holding within a wider (and therefore significantly bigger) portfolio. Robo-advice in the UK still hasn’t got things quite right, though it’s getting closer. I’d like to see a product that is cheap (less than 0.5% pa, all-in), simple and well-diversified for the guys with £10K to £50K to invest. And that amounts to more than a front-end to a single Vanguard fund. Maybe the next article in this series will be about just that.